The instrumentation developed at the Department of Physics, Politecnico di Milano, is composed by three main parts: injection optics, detection and control sections. The injection part drives the laser pulses (100-200 ps), emitted by two semiconductor laser heads (at 690 nm and 820 nm), directly on the head of the subject. Using a couple of fiber optic switches is possible to create up to 18 injection points on the sample. The collection of photons diffused by the tissue and the acquisition of time resolved reflectance curves is provided by the detection section. 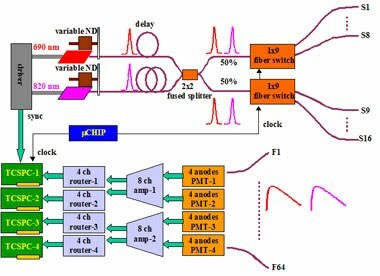 This part is composed by 4 parallel and independent acquisition chains each of them is composed by plastic optical fibre bundles, a compact multichannel photomultiplier (PMT), a read-out electronics and a time correlated single photon counting board. The presence of four parallel detection chains and multichannel PMT permits to obtain up to 64 detection points on the sample. The entire system is controlled by a micro controller unit interfaced with a personal computer in order to obtain real time measurements. This instrumentation is designed to be integrated in a more complex apparatus in which biometric sensors provide the acquisition of heartbeat and breath frequency and a dedicated software provides the management and the stimuli presentation to the subjects. This instrumentation is under continuous improvement. For this purpose the Functional Imaging Lab is equipped with the instruments for fibre optics manufacturing, for electronic board designing and for the programming of systems based on micro controller.